Enjoy this six-hour narrated antebellum adventure with a professional Tour Guide as you journey through swamp and wetlands to a magical place where time has stood still, the Old River Road. Learn of the Land of the Creoles, plantations, slaves, slave revolts, Quadroon Balls and more.... Experience the showplace of the Old South, the majestic Oak Alley Plantation. Tour the antebellum mansion, and take pictures of her beautiful grounds. 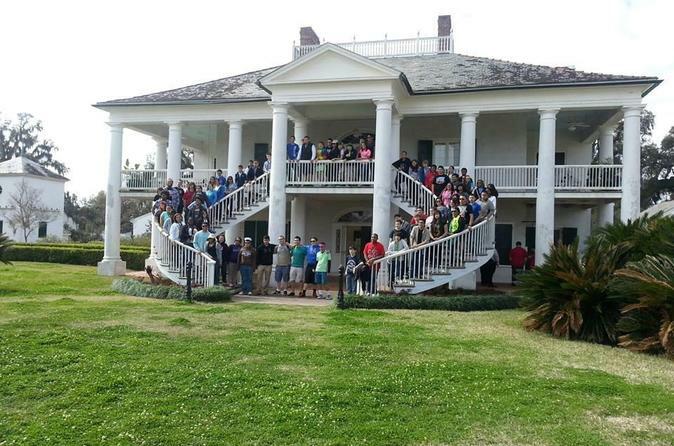 Tour historic Evergreen and her 22 slave cabins, then after Evergreen head back to New Orleans. On the way you will pass Lake Pontchartrain, mashers, wetlands and the spillway. Your Tour Guide will let you know of other things you can do in New Orleans and can recommend restaurants, music, museums and more. Tour leaves New Orleans at 8:00 am and returns around 2:15 pm. Offers hotel pickup and return, from the hotels in the French Quarter and downtown New Orleans. Free parking available at our office for a small or medium car if your hotel or B&B is out of our pick up area. There will be a professional Tour Guide on board. Car seats are require for babies and toddlers, we can provide one upon request. Plantation homes are old houses and are not wheel chair accessible. Your tour will take place on a 25 passenger mini-buses. Our buses are not motorized wheel chair accessible, but we can lend you a lite 22 pound wheel chair, if the person in need is able to get in and out of the bus. No lunch is included, but food can be purchased in Oak Alley's Cafe.